Daniel F. Cleary, is an internationally recognized, certified Hypnosis Instructor and a certified Master Practitioner of NeuroLinguistic Psychology. Teaching Hypnosis and Hypnotic Techniques throughout the United States and Europe to Doctors, Psychologists, Therapists and other Hypnotists, his specialties include Pain Relief and Personal Transformation. Daniel is the founder and director of HYPNOSIS FOR HEALTH LEARNING CENTER, based in North Palm Beach, Florida. 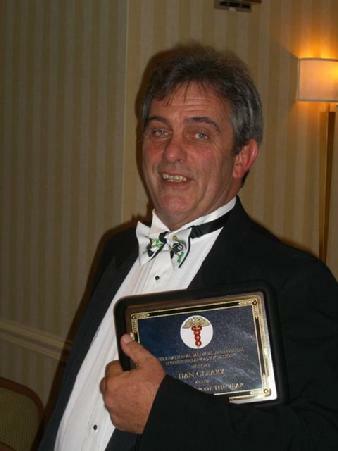 He established and serves as president of The Palm Beach Hypnosis Group. He is a regular member of the teaching faculty at many of the national and international Hypnosis conferences and has provided specialized training for Hypnotists and licensed professional therapists since 1996. Dan came to Hypnosis as a sufferer of chronic pain. In 1978 he was partially paralyzed as the result of a motorcycle wreck. The major injury sustained is referred to as a Brachial Plexus Avulsion, which in his case causes a burning, crushing sensation throughout his arm and hand, in addition to the paralysis. For five years Daniel was unable to sleep as we generally understand sleep. He then learned hypnosis and within a week began sleeping more regularly. Since that time he has devoted himself to developing techniques and approaches for the relief of chronic conditions. While still a "Chronic Sufferer" Dan has learned to shift the discomfort and participate fully in life. Join Dan and learn to assist your clients to excel. "In my opinion Dan Cleary is the most gifted medical hypnotist out there for people who suffer from intense, chronic pain. "CHANGING PAINS" goes way beyond conventional "pain management" and advanced hypnosis training... Dan Cleary powerfully guides his students through his own personal journey to the limits of Mind-Body healing and brings them back with the confidence, knowledge and skills necessary to help their clients reduce or eliminate their pain." "Dan Cleary knows more about pain management than any other hypnotherapy teacher that I've met - because, as they said of Milton Erickson, 'he walked that road'. All the discoveries that Dan has made in his own journey to deal with physical pain have been incorporated in his teachings. His Hypnosis for Pain Management classes are the most comprehensive and inclusive that I've come across. Dan also understands the imperative of making the learning experience a dynamic and enjoyable process!" "I needed to tell you how powerful your message was for me ... I felt a little short changed until I happened to stroll into your talk. Your respectful, professional and understated grace struck such a chord with me ... Everything you said, and how you said it amplified my values and beliefs. I hung on every word you said. Mr. Cleary, you have become an instant role model for me." "This class has not only changed my way of dealing with my own chronic condition but also taught me new and very effective ways how to support my clients in gaining back a sense of control." "I can see the positive side of my experience, how I would have never started working at 6 a.m. to be able to attend your class if it was not for the pain I still felt, how I learned and am learning from you, and how it is all making me grow and heal in more ways than through hypnosis thanks to you." Dan is a regular presenter at seminars and conferences around the United States and Europe. He may be available for private sessions when time permits at the conferences. Naturally, you may shedule private sessions and group presentations at Hypnosis for Health Learning Center in North Palm Beach, Florida. When you are interested in arranging to have Dan present one of his signature programs in your area, contact him through Hypnosis for Health Learning Center. Many of the programs available may be presented either as personal or professional development classes. So when you know you want the best for your group we can tailor the program to suit your requirements. Check his schedule on the EVENTS page.